You can also access real-time details and statistics that provide you with snapshot information about an individual broker at the point you access this information from the DataServer Control page. Review this information to help you assess a broker's performance. 1. From the grid frame for Resources, click the Edit icon to display the details page for the DataServer broker instance whose processing details you want to view. 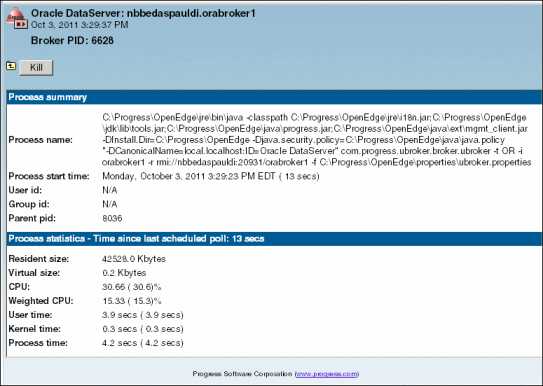 See Accessing OpenEdge Management resource information for the detailed steps. The Process summary section identifies the Process name and Process start time. User id and Group id values appear when UNIX-based data is shown. The Parent pid identifies the identifier number associated with the process that spawned this current process. The Process statistics section presents details about the broker's real-time operational status. Values presented without parentheses identify that the processing time determined since the last scheduled polling interval, as noted, has occurred. Values presented within parentheses have been calculated based on information obtained since the start of the process. The following table identifies and describes the fields of information presented in the Process statistics section. The percentage of time spent using the CPU in either the user or kernel mode since the last scheduled poll divided by the number of CPU processors on the system. This value appears only when there is more than one CPU process on the system where the process is running.